Leymah Gbowee, co-winner of the 2011 Nobel Peace Prize, loves small local initiatives that fight the problems of the world. So when she heard that a group of international students at a college in Virginia were raising funds for orphans of the Ebola plague in her native Liberia, she agreed to come to campus and even pay her own travel expenses. 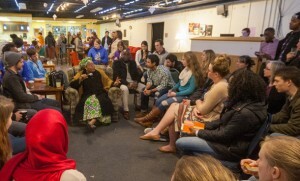 It also helped that Gbowee knew Eastern Mennonite University well. She had earned a master’s degree there in conflict transformation in 2007. Gbowee, a social worker who led a women’s peace movement that helped end Liberia’s civil war 10 years ago, addressed a fundraising dinner for over 100 people at EMU on Feb. 7. Organized by the school’s International Student Organization, the event was followed by a public address to about 200 attendees, who put contributions into baskets passed by the students. The events raised over $4,000 after expenses for the care of children whose parents died from Ebola. The funds will go to the Nobel winner’s Gbowee Peace Foundation Africa in the Liberian capital of Monrovia. The foundation makes grants to grassroots groups, including two Liberian organizations founded by graduates of EMU’s Women’s Peacebuilding Leadership Program. Gbowee told the stories of three Liberian heroes – a doctor who cared for Ebola victims in his humble clinic at the risk of his own life, a taxi driver who transported dangerously infectious patients to the hospital, and a young man with a full-time job who provides care for orphans in his off hours. The epidemic has finally abated in Africa, she said. The Ebola clinics are emptying and students are going back to school. But, she added, the people still live in fear, the economy is ruined and orphans abound. Gbowee has a reputation for speaking truth to power, most notably when she publicly confronted the president of Liberia during the country’s civil war. Most recently she criticized the United Nations’ humanitarian aid efforts during a meeting of the UN Security Council. During a question-and-answer session at the conclusion of her speech, Gbowee praised young people for their idealism and gave advice on how to start on the path to activism. “Ideas that are ground-breaking and keep you awake at night might seem like crazy ideas,” she said. “But write them down, tell a friend and step out boldly. Getting angry about an unjust situation is not only okay, she added, but a good thing. The students who organized the fundraiser represented five continents: Kaltuma Noorow and Nandi Onetu of Kenya, Winifred Gray-Johnson and Gee Paegar of Liberia, Sun Ju Lee of South Korea, Wael Gamtessa of Ethiopia, Brenda Soka of Tanzania, Zoe Parakuo of the United States, Norah Alobikan of Saudi Arabia, Danika Saucedo of Bolivia, Victoria Gunawan of Indonesia, and Marcus Ekman of Sweden. Susannah Lepley, EMU’s director of multicultural and international student services, is the advisor for the International Student Organization. 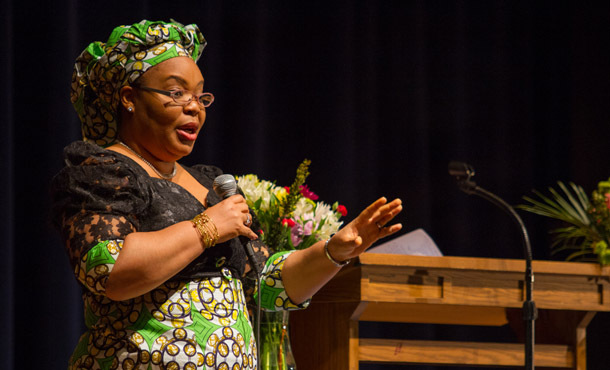 Gbowee’s last trip to EMU was in April 2014, when she was the commencement speaker for the graduating class that included her son, Joshua Mensah. Before that she came to campus in 2011 to accept the “alum of the year” award. Just prior to her arrival, the 2011 Nobel Peace Prize was announced, and thus her appearance made for a frenzied weekend. Editor’s note: Kara Lofton, a 2014 EMU grad, reported on Gbowee’s appearance at the Ebola fundraiser for local public radio station WMRA; her four-minute report can be heard here. Congratulation for having raised over $4,000 after expenses for the care of children whose parents died from Ebola. Lets continue supporting the needy in our communities.